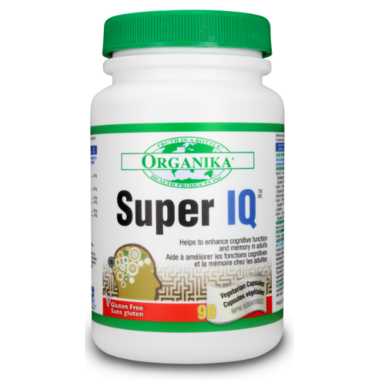 Organika Super IQ helps to improve cognitive function and memory in adults through the synergistic action of six ingredients. Balances energy levels and reduces the fatigue associated with mental sluggishness and lack of focus. Directions: Take 1 capsule two times per day with a glass of water. Caution: Consult a health care practitioner if symptoms persist or worsen. Consult a health care practitioner prior to use if you have any type of acute infection or lung problems; are taking immunosuppressive, diabetes or seizure medications, or any other medications; or are following a low protein diet. Do not use if you are taking health products that affect blood coagulation (e.g. blood thinners, clotting factor replacements, acetylsalicylic acid, ibuprofen, fish oils, vitamin E) as this may increase the risk of spontaneous bleeding; have high blood pressure; or if you are pregnant or breastfeeding. Hypersensitivity / allergy is known to occur, in which case, discontinue use.